Photo Cutline: Bob Forbeck-Owens, a CBC student, took on the role of being a choke operator on the new UltraLight Simulator purchased by CBC’s Oil and Gas Technology Program. Forbeck-Owens is one of the first students to operate the state-of-the-art simulator. 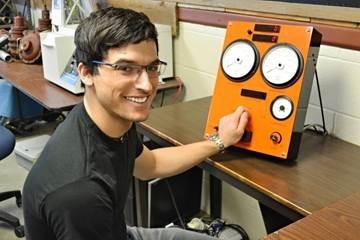 Photo Cutline: CBC student Omid Ebrahimi is all smiles after successfully completing his first simulation as a well driller on the new UltraLight Simulator. Ebrahimi had to troubleshoot a pressure issue in the well using the knowledge he’s gained during his summer oil and gas courses. BEEVILLE, TX—Coastal Bend College recently purchased an UltraLight Simulator for students in the Oil and Gas Technology Program to utilize in their courses beginning summer 2013. The purchase was possible through the Perkins Grant Program which helps fund improvements to workforce programs and equipment at CBC. “The UltraLight Simulator allows students to troubleshoot scenarios that can and will happen once they go out into the workforce. They get hands-on experience dealing with well control, blowout prevention, leak-off tests, and seeing what happens overall in a well operation. As the instructor, I remotely control what happens on the simulator, so I can create an infinite number of unique situations for them to troubleshoot. This is an amazing simulator,” said Roy Coley, oil and gas technology professor at CBC. The UltraLight Simulator contains four components—a laptop station on which the professor can program and create problems for students to troubleshoot, a remote choke console, a driller’s console, and an interactive trainee LCD touchscreen that displays production/valve information to the students. For the simulator to run properly, a pair of students has to work together as a well driller and a choke operator to fix issues and problems that arise during the simulation. Omid Ebrahimi and Bob Forbeck-Owens were the first students to try out the simulator during class this summer. Their first simulation involved too much pressure accumulating in a well, and they had to find a way to safely level off the pressure to prevent a blowout. They both admitted that although it was just a simulation, they felt a bit of stress in getting everything all figured out. “Well, I have to say it’s a good thing the blowout prevention worked in that particular situation,” Ebrahimi said, “You know, it’s really nice that we get to practice on this simulator in class. In a real job, these sorts of issues could be potentially dangerous, but here at CBC we get to focus on learning proper technique and focus on safety,” Ebrahimi said. 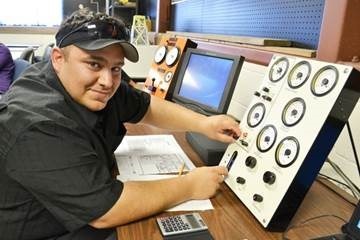 Access to hands-on tools and high quality instruction are what led Forbeck-Owens to make the move from the big city of Nashville, Tennessee to Beeville, Texas to enroll in the CBC Oil and Gas Technology Program. He only needs a few more classes to finish with his associate’s degree from CBC this fall. “I researched the heck out of all the oil and gas programs in the nation, and this one looked the best to me. We get hands-on experience on things like this simulator, and Mr. Coley does an excellent job of teaching us what we need to know. I know I’ve made the right decision coming here, and my family is supportive of my decision,” Forbeck-Owens said. All students enrolled in the program will have access to this simulator in their oil and gas courses from July 2013 and onward. Coley also stated that he hopes to acquire more simulation technology like this in the future to provide his students with a full scope of what a career in the industry could be like. For more information on the CBC Oil and Gas Technology Program, please contact Roy Coley at (361) 354-2551 or visit www.coastalbend.edu/oilgas.